Several references in the Holy Bible pertain to "ears to hear" and the words "eyes to see." The scripture that best describes this story is Ezekiel 12:2. "Son of man, thou dwellest in the midst of a rebellious house, which have eyes to see, and see not; they have ears to hear, and hear not: for they are a rebellious house." This is Deborah's story. Deborah Ross has written a valuable book of compassionate Christian advice for failing marriages. She experienced numerous hardships and challenges in her personal life and bravely revealed brutal truths that her empty marriage brought her to a near mental breakdown, severe stress and temptations that might have lured her away from her strong intimacy with God and consequently - divorce. Ms Ross remained prayerfully strategic and strong in her battle to bring her husband to his knees before the Lord. She proved that standing and believing God's Word without doubt for her husband's salvation and "If God brings you to it, He'll see you through it" - my favorite true quotation - works. Her faith and relationship with the Father, the Son, and the Holy Spirit was essential to bring about the changes and miracles she prayed for. Deborah's heartbreaking story was at times very awkward to read because of personally relating too much of what she went through. This story is not about me - but I saw myself throughout the sad and emotional conflicts she experienced. Her story is very disturbing to my own emotions and has given me hope for such a grace of God to fall on my own prayers. "Have you ever wondered if you married the wrong guy?" The first sentence of her story struck me as bold….however a question that every wife might have wondered, I admit I have. Deborah then further questions …"Did you think once you became born-again, that your husband would quickly see the difference Christ has made in your life and repent, only to be let down by his indifference to the need for this great salvation?" How did Deborah know my own thoughts and questions? Her questions don't stop there and she is preparing the reader for victory. "If you have answered "yes" to any of these questions, this book was written with heartfelt wisdom, biblical knowledge, and experience just for you!" She lays out eight action instructions to follow and beautiful scriptures throughout the book to meditate on God's word in applying her principles to our own situations. Deborah Ross is clearly an organized individual, extremely talented, self admitted type-A personality with a discerning and wise soul. If an unbeliever picks up this book, I pray that person will read Deborah's writing with an open mind and follow the journey to salvation. Undoubtedly, reading this book as a believer will enhance your personal relationship with the Lord and add wisdom to your soul. At the end of the book is a lovely prayer for marriage, as well as a prayer for salvation. Perhaps her advice isn't for everyone, or some parts of her story won't initially be understood, which in my estimation would depend on where you are in your journey with the Lord. Using Deborah's own words for a final thought and my compliance - she says, "It is my prayer that the Lord will use my testimony to give you hope in what may seem to be a hopeless situation." This book is not another fluffy Bible study of "how to" but rather a lay-it-on-the-line transparent testimony and radical challenge for you to consider in being God's chosen woman for such a time as this (Esther 4:14)! 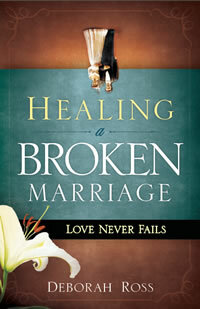 To get your copy of Healing a Broken Marriage CLICK HERE!